« Lots of No Generation Days! Gorgeous Days On The Water! What a beautiful day! Maybe upper 70s, lots of sunshine and just enough wind to keep you comfortable and keep a little chop on the water. We are basically looking at several more days of weather like this. Maybe a little warmer, in the low 80s, and no rain chances until the middle of next week. No big chance in generation pattern. Off all morning then on maybe by noon or sometime after noon for a couple hours then back off again. We have to remind ourselves what time of the year it is. Fishing right now is pretty much normal for this time of the year. Good days, tough days. Dissolved oxygen better on some days than others, and some places on the river are a little more favorable than others for holding fish. Now is the time we really have to fish a little and not catch all the time like we do in the Spring. Yes, we will see and catch some nice fish this Fall during the spawn. Ketchup time again! Dana on the water a week ago this past Sunday with Ed and Kate from Illinois. The morning was slow. By late morning the bite started picking up and they caught fish on the copper dun, rusty midge and black copperhead midges. Also caught some stripping the JQ streamer. 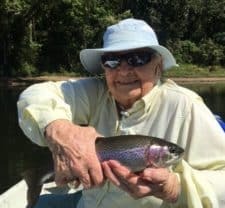 George had to get a fishing fix Wednesday so she spent a few hours on the water with Stan. She was a happy lady when she came off the water. Thursday, Carolyn took Susan and Joel from Connecticut out for a half day instructional trip. They wanted to learn as much as they could in that time about fly fishing. From leaders to tippet sizes to fly line configuration and weights to rod lengths. We covered a lot of ground and they also got a pretty good handle on the roll cast as well as the pick up and lay down cast. The icing on the cake were some fish they caught on the ruby 2 midge. I think they are hooked! and Mark were out with Stan. Their pattern was the size 18 copper dun midge. Saturday, Gina and Carolyn spent the day in Iola, Kansas. We did the fly casting portion of their Becoming an Outdoor Woman (BOW) program. What a neat organization and great opportunity for these ladies to learn everything from handling guns to archery, setting up a duck blind and decoys and, of course, fly fishing. We left all the guys here to run trips. Stan took Tom from Nebraska out. They caught fish on the copper dun, then the P&P midge, including a nice 17 inch rainbow. Ed and Rick spent the morning with Dana. Pretty good day on a size 22 P&P, the copper dun and stripping the golden variant sculpin and a brown JQ. Keeping remembering to make certain your fish are ready for release. Low DO will take its toll!! 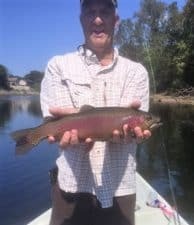 This entry was posted on Wednesday, September 28th, 2016 at 10:22 am	and is filed under Fishing Reports. You can follow any responses to this entry through the RSS 2.0 feed. You can leave a response, or trackback from your own site.